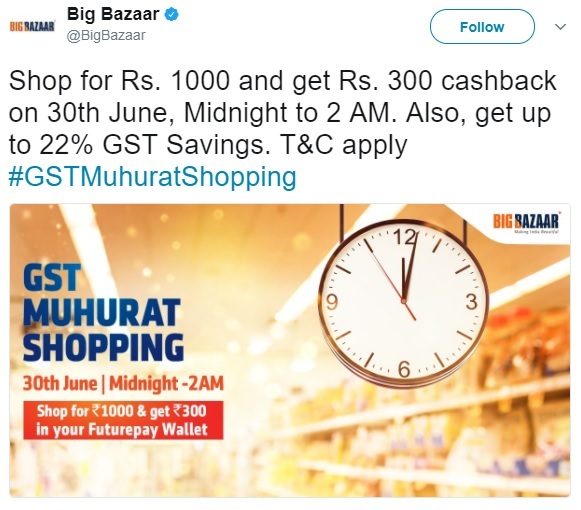 Big Bazaar has announced its GST Sale on 30th June,They have named it Big Bazaar GST Muhurat Shopping Sale. In This Shopping Sale Users Can Upto 22% GST Save On 30th June Midnight 12 AM To 2 AM. Also Shop For Rs. 1000 And Get Rs. 300 Cashback in their Future Pay Wallet On 30th June,12 To 2 AM. Read And Follow Below Mention Steps To Grab Big Bazaar GST Sale Offers. In Big Bazaar GST Sale Users Will rReceive Rs 300 In Their Future Pay Wallet,Each Time They Spend Rs 1000 Or More.